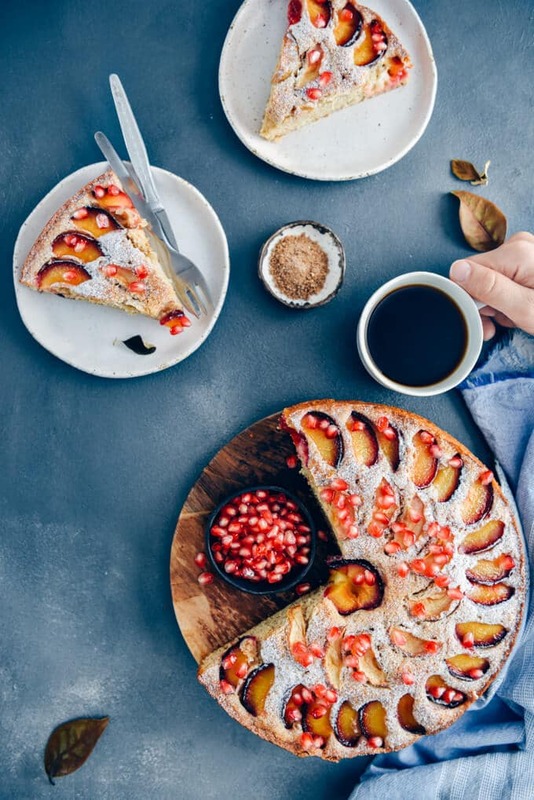 This easy Apple Plum Cake is a great way of using fresh plums and apples in fall. A spiced butter cake batter is topped with fruit slices and baked for a special cake that is not too sweet yet super delicious. One of the recipes you loved most on the blog this summer was Blueberry Peach Coffee Cake, a wonderful light dessert. As we are all ready for the season change now, I wanted to make something more comforting. 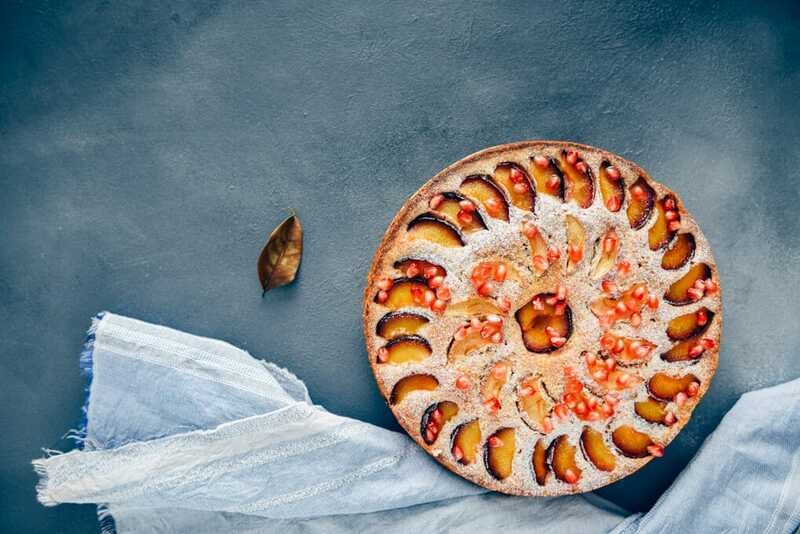 This buttery Apple Plum Cake fits the bill perfectly even with its tempting smell spreading in the house when baking. The amazing smell and flavor of the spices in the cake such as cinnamon, nutmeg and cardamom make you feel ready for chilly days. 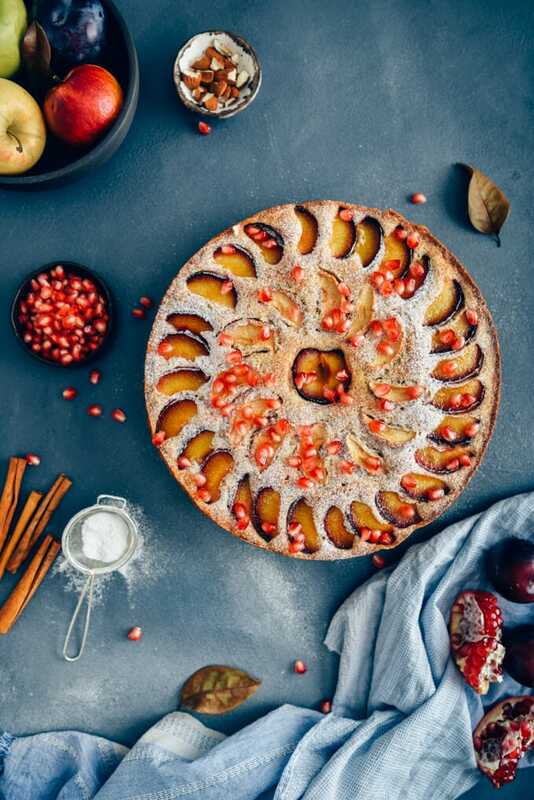 The buttery and spiced base of this apple plum cake tastes and smells so good! The fruit slices on the top are slightly covered with brown sugar, which both complements their tangy flavor and gives them a nice texture. Just like my Lemon Zucchini Bread recipe and several other cake recipes on this blog, I used kefir in the batter for a moister texture. It turned out UH-MA-ZING! You have to try this recipe when plums are still in season! Make it with apples only if you can’t find plums. 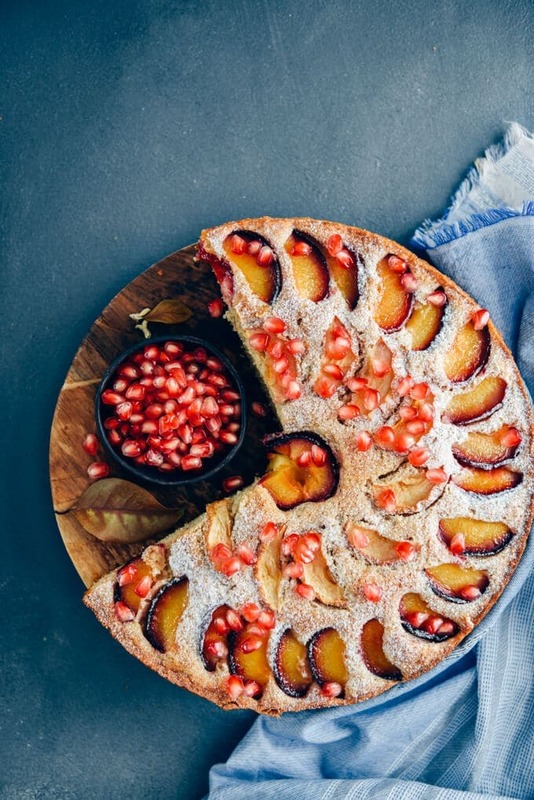 Pomegranate arils on the top are totally optional, but they make a nice crunchy touch. Oh and if you have never removed pomegranate arils before, check out How to De-Seed a Pomegranate on Sophisticated Gourmet. Start by whisking the flour, salt, baking powder, cinnamon and nutmeg in a medium bowl. I use a mixture of whole wheat flour and all purpose flour because the flavor and the dark color of the former match perfectly with the spices here. Next, cream the butter and sugar in a large bowl until pale and fluffy. Add the eggs one at a time. Finally, pour kefir and mix to combine. Gradually add the flour mixture and mix again. You will end up with a rather thick batter. Spread the batter in the prepared springform pan and top it with sliced apples and plums. Sprinkle brown sugar and cinnamon over the fruit slices. Bake until a toothpick inserted into the center comes out clean. If you like pomegranate as much as I do, garnish your cake with it. Keep this apple plum cake covered at room temperature for 3-4 days. I don’t think it will last that long though. Can this cake be gluten-free? Yes! You can easily make the gluten-free version of this recipe by using a combination of almond flour and coconut flour or rice flour. It might not be the fluffiest cake, but will definitely be one of the tastiest cakes that you are a fan of. 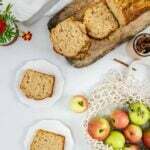 A buttery spiced cake with apple and plum slices makes a perfect fall treat. Grease the bottom and the sides of a 9-inch springform pan. Line the bottom of it with parchment paper and grease it too so that the cake can be removed very easily. Put it aside and preheat the oven to 350F. In a medium bowl, whisk together the whole wheat flour, all purpose flour, salt, baking powder, cinnamon, nutmeg and cardamom. In a large bowl, cream the butter and sugar using an electric mixer until pale and fluffy. Add the eggs one at a time. Then pour kefir and mix to combine. Gradually add in the flour mixture and mix just until everything is combined. Don’t overmix. Spread the batter in the prepared pan and place the apple slices and plum slices. Sprinkle brown sugar and cinnamon over them. Run a knife around the edges of the pan when the cake is removed from the oven. Remove the springform edge and let the cake cool completely before slicing and serving.